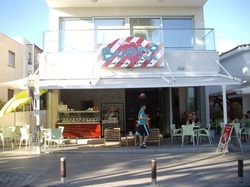 Buono Cafe is a snack bar and ice cream parlour located opposite Ayia Napa museum, just 5 minutes walk from the harbour and also from the centre of Ayia Napa. It is open during the summer months, in the day time and at night. Cafe Central is open during the day time and at night during the summer months and also weekend nights during the winter. It serves snacks, international dishes and platters and also has shisha pipes. It has a choice of seating including comfy sofas and seats outside great for people watching on one of Ayia Napa's busiest streets. Captain Andreas is just off the top road, just a couple of minutes from the main square in Ayia Napa. 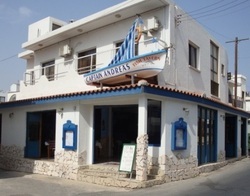 It serves seafood as well as other Cypriot and international dishes and is open for lunch and dinner. 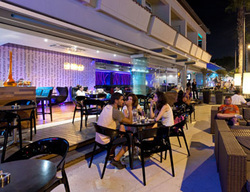 Carina Bar is part of the Carina Apartments complex and is open for breakfast, lunch and dinner. It serves international dishes, snacks and pub grub style food and is located on Nissi Avenue mid way between the centre of Ayia Napa and Nissi Beach. Castelli Restaurant is open during the summer months for dinner service and offers dining in a pretty courtyard setting. The menu comprises Cypriot and international dishes and Castelli has a great central location on Makarios avenue, just a couple of minutes walk from the main square of Ayia Napa. Cavo restaurant serves traditional Cypriot grill dishes as well as international and pub grub style food, It is open for breakfast lunch and dinner during the summer months and is located on Ayias Mavris, the main strip in Ayia Napa. Located right on Grecian bay beach by the harbour in Ayia Napa, Christatsos serves a range of international dishes and snack options and is open during the daytimes and evenings in the the summer months. 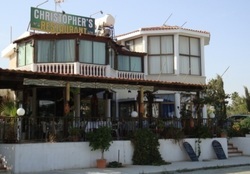 Christopher's restaurant is located at Sandy bay, just off the beach itself and is open during the summer months. It serves traditional Cypriot food as well as international dishes and is open for lunch and dinner. Cicero is open for lunch and dinner all year round and is an especially popular lunchtime venue during the winter months due to it's sunny terrace. It is located just off Nissi Avenue in the centre of Ayia Napa and serves traditional Cypriot food, Meze and international dishes. 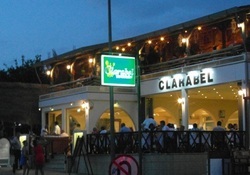 Clarabel is open for dinner throughout the summer as well as at weekends during the winter. It's speciality is flambé and it's extensive menu contains Cypriot and international dishes. 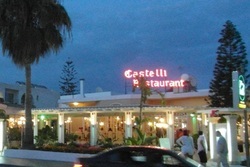 This is a very popular restaurant just a couple of minutes walk from the main square of Ayia Napa. Cornelia cafe is located on Makarios Avenue, one of Ayia Napa's busiest streets and serves main meals, snacks and crepe's. It is open throughout the day and evening during the summer months. 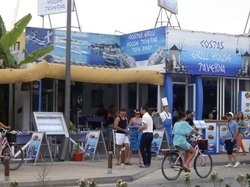 Costa's Grill House serves traditional Cypriot meals, many home cooked or from the charcoal grill, as well as fast food, kebabs and Gyros. It is open during the summer months, both daytime and evening and is located in between the harbour and the centre of Ayia Napa. It was full renovated with a new menu for 2013, previously being called Quick Taste. The Crown was fully rebuilt for 2013 and is now a modern venue for both food and drinks. It is open both daytimes and evenings and is located around 5 minutes walk from the centre of Ayia Napa, opposite the Sancta Napa Hotel. 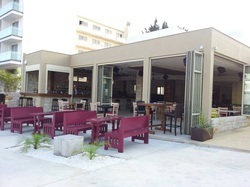 De Medici Italian restaurant is located on Nissi Avenue and is open all year round. It has an extensive menu of Italian food and serves lunch and dinner. 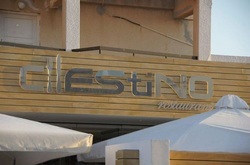 Destino Lounge is a very modern stylish looking restaurant and is located just off Nissi Avenue and is open during the summer months for lunch and dinner. During the winter it is open at weekends.